At first glance, most people don’t see the Buick LaCrosse and think of great handling, fuel economy and new technology. Now is the time to take another look. One peek at Buick’s new EcoTec and CXS models and you’ll be impressed. The 2.4-liter EcoTec four-cylinder engine is more than impressive, whether driving around town or on the highway. After spending the day test driving the new engine, I was convinced that Buick won its multiple awards for safety and best buy awards by listening to what its customers want. “Get up and go” and fuel economy unite in a beautiful new Buick. The CXS powered by a new smaller V6 is smooth running and produces nice daily power in its up level package. Available on CXS is the impressive HiPer Strut Suspension System, which offers better road feel and handling. Although the suspension system may weigh a bit more, it doesn’t affect fuel economy because there’s more tire on the road. Even more impressive is that the new suspension, developed in-house at GM, offers improved ride and feel. You can really feel the difference in comparison to the previous models. 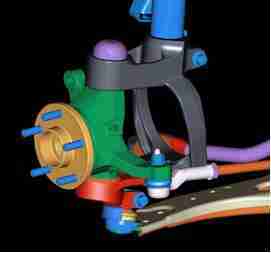 What is HiPer Strut Suspension System – check out the video and learn more! • Reduces torque steer, offers smother ride. Reduces road feedback. • Keeps more of the tire on the road. By changing the angle of the suspension and decreasing spindle length, it keeps more tire patch on the ground which offers better handling. Buick de-coupled the suspension, it isolates the feedback more but stiffens the ride, improving both the ride and overall performance.